The Sabian symbols a representative of the 360° the zodiac. Each of the degrees is represented by a single symbol. For this reason the symbols are sometimes seen as the “360° of wisdom”. These are open to a degree of interpretation and a quiet atmosphere is required to interpret the symbols. The symbols are meant to provide a guideline rather than an absolute answer to a particular concern. 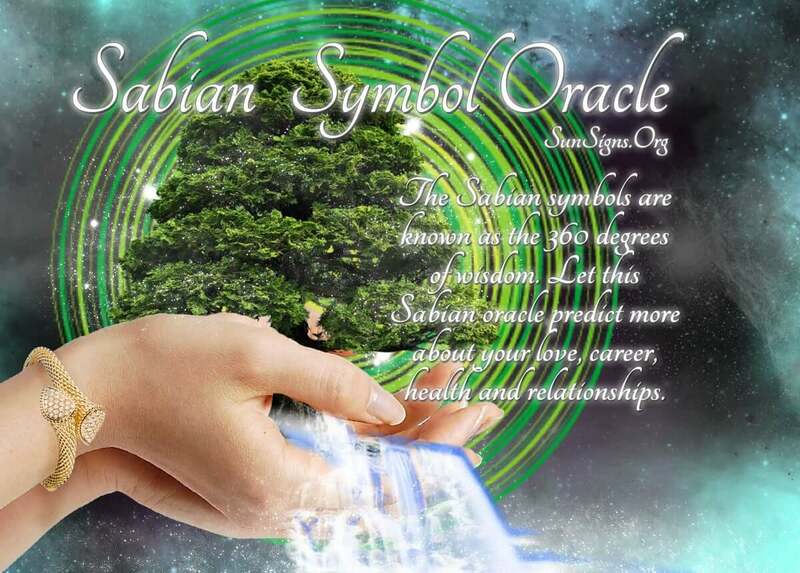 The free online Sabian Symbol Reading is excellent and available today. The Sabian symbols are also sometimes referred to as “360° of wisdom”. When people are lost this Oracle is a tool which may provide some direction. The Oracle does not provide an exact answer but helps you to find a direction and guides you as you seek an appropriate solution. This is available to any person seeking an answer. Because there are 360 symbolic images in the Oracle and symbols provide you a reference to the 360° of the zodiac. The Oracle is in the main one that gives answers that are reasonably clear and that are meant to guide you to find an appropriate solution rather than necessarily present you with a solution. In 1925 a clairvoyant was the first to bring the symbols into the light of day. Each degree of the zodiac is represented by a Sabian symbol. There is a meaning assigned to each of the symbols and this is interpreted by the individual to determine a solution to their concern. The symbols were channeled by Dr. Marc Edmund Jones and Denise Wheeler. Dr. Jones believed that Ms. Wheeler had actually reached an “ancient mind matrix” of the alchemists of ancient Mesopotamia who were known as the sapiens. The symbols can be used by astrologers in combination with a natal chart but equally the symbols can be used by those with no specific knowledge of astrology to become more conscious of their past, present and future. There is indeed a flavor of the 1920s in the United States with reference to some of the symbols. Some of these would be: a suffragette, a Bolshevik propagandist, a Davenport, brownies and other spiritualistic phenomena. In 2017 this may not be our most up to date set of images but they are effective and they do help to find solutions to concerns. There are a certain number of requirements needed to use the symbols effectively. A quite place to work would be one. As an example number 342 could be interpreted as life pushing you through ordeals and hardships. So it is necessary for you to draw on your willpower and to maintain your courage to obtain a final victory. You may need to exhibit your skills or taken entrance exam to obtain your goals. This would be a transitional phase in your life when you are preparing to take a major step toward a higher purpose. When doing a reading a high level of concentration is required together with a peaceful location which allows the seer to interpret the symbology of the Sabian system. A quiet and peaceful location is deeply needed.